If you’ve seen the news or scrolled through your timeline, you’ve likely heard about the NAACP’s call for the resignation of Virginia Governor Ralph Northam after a racist and problematic photo from his 1984 medical school yearbook surfaced on Friday. The image shows two people in racist costumes: One person is dressed in blackface, and another is wearing a full Ku Klux Klan uniform. Blackface was not acceptable in 1984 and it’s not acceptable in 2019. Mocking the painful history of hatred and racism endured by black people is never okay and we will not stand for it. Advocates and followers have flooded our timelines with their expressions of pain and disappointment in seeing these hurtful images. Our families and communities deserve better leadership. This is why our work matters. As the largest civil rights organization in the country we have an obligation to hold elected officials accountable for their actions regardless of years passed. Together we can create an America free of discrimination and hatred. Stay updated on this and other news. 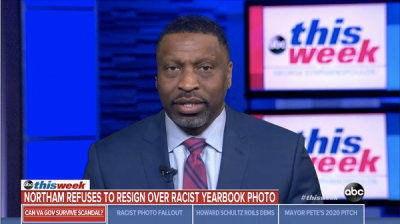 Derrick Johnson, the president of the NAACP, said on Sunday that he doesn't see how Virginia Gov. Ralph Northam can survive the fallout of a racist yearbook photo that emerged on Friday. He told ABC News Chief Anchor George Stephanopoulos on "This Week" that the explanation Northam offered in a news conference Saturday doesn't make a difference "at this juncture." 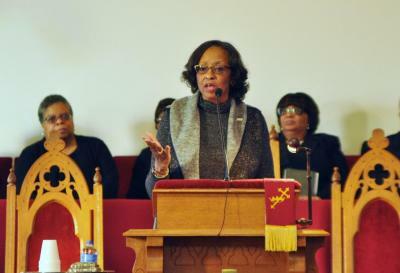 The Montgomery County-Radford City-Floyd County Branch of the NAACP recently hosted the area’s Rev. 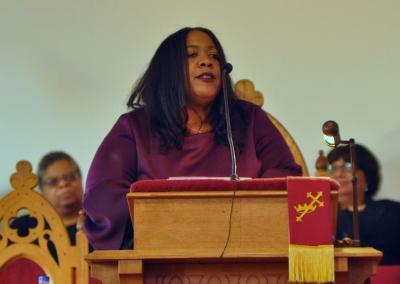 Dr. Martin Luther King, Jr. Community Celebration on January 20, 2019, at Schaeffer Memorial Baptist Church in Christiansburg. The celebration opened with a rousing rendition of “Lift Every Voice and Sing,” followed by an invocation by Rev. Marlin Reeves. 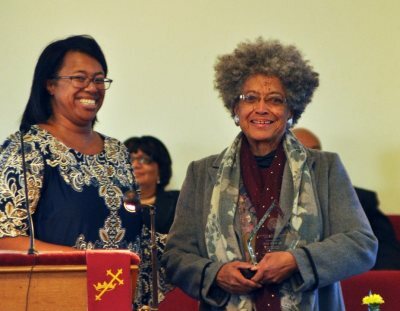 Karen Jones, Political Action Chair, presented a branch Service Award to out-going President Rita Irvin. 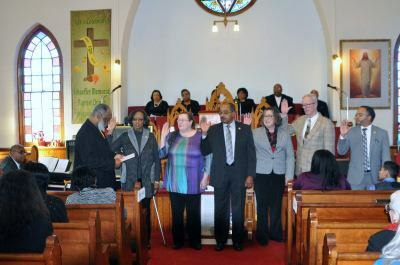 Then officers were installed for the 2019-2020 term: President: Deborah H. Travis; Vice President and Area 10 Chair: Alvin Humes; Secretary: Terry Goodson; Treasurer: Allen Palmer; and At-Large Executive Committee members: Gunin Kiran, Johnathan Williams, Rev. Marlin Reeves and Rev. Michael Sanborn. 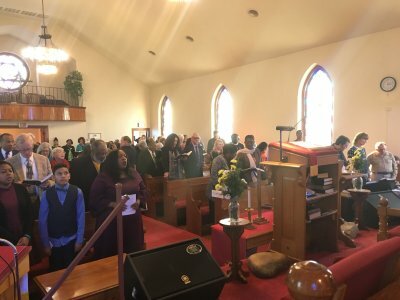 The Youth Council honored Dr. King with a tribute to his life by Youth Council Vice President Miss Allison Foster, and a poetic tribute from Youth Council member Master Melvin Palmer. 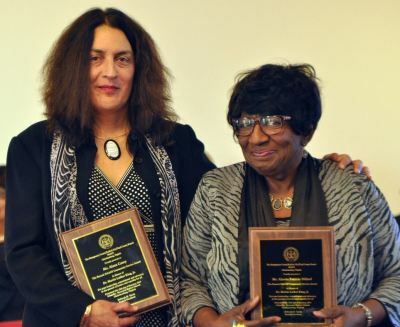 The annual MRF NAACP Branch Community Service Awards in Honor of Dr. Martin Luther King, Jr. went to Ms. Alexa Casey, of Blacksburg, and Ms. Alzeria Patricia Dillard, of Christiansburg. Dr. Casey is a licensed clinical psychologist who focuses on veterans and people with disabilities. She is a co-founder of 100+ Women Who Care NRV, which is an organization that provides money to local non-profits. They have donated over $100,000 in the last couple years. She also serves as the chair of NRV Indivisible, a political action group responsible for putting pressure on congress for a variety of equality and justice issues. Casey was a key planner for the March for Our Lives event at the Lyric this past year. She has also been involved with NRV Conversation, a local group committed to dialogue with people on both sides of the aisle to encourage discourse on controversial topics. Dr. Casey has two teenaged children, and she enjoys photography, hiking, andgraphic design. Ms. Dillard is a woman of many talents. She has lived in Christiansburg for 57 years and has worked diligently for numerous years providing services to this community in a variety of ways. One of her greatest passions is sewing, which she has been doing since she was 14 years old. Her current sewing project is making dresses for girls and women in Haiti to support Haiti Earthquake Relief and Recovery efforts. So far, she has made over 20 dresses with donated fabric, and intends on making more until she finishes with all of the fabric given to her. Early in 2018 WDBJ 7 recognized her for this outstanding work. Ms. Dillard has been a business woman in Christiansburg for many years, running a beauty shop, a charter bus line, and a catering service. She has four children, eight grandchildren, and eight great-grandchildren, and she loves to sing and cook. A special song was then performed by Gloria Dillard and Cecelia Carter in honor of Dr. King and the MLK Award recipients. 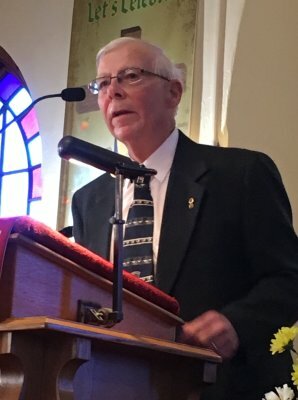 The Samuel H. Clark Memorial Scholarship Fund offers up to five scholarships of $1000 apiece to youth who extend their education beyond high school at a college or technical school. An offering was taken and $1365 was raised for this fund. To be eligible, youth must be a member of the Youth Council, or be a child or grandchild of a branch member and live in this area. Dozens of local youth have been supported in this way through the years. 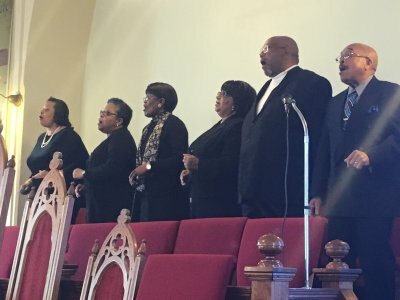 During the offering the choir from Schaeffer Memorial Baptist Church, led by pianist Michael Hicks, sang a rendition of “My Country ‘Tis of Thee,” in which the repeated refrain of “Let freedom ring” was followed by the names of cities called out where justice was needed. David B. Travis, Jr. introduced the keynote speaker, Dr. Brandy Faulkner, who is a Professor of Political Science and Africana Studies at Virginia Tech. Beginning with King’s “Letter from a Birmingham Jail,” about “why we can’t wait,” Faulkner reflected on the sometimes-overwhelming challenges ahead of us. She suggested we arm ourselves, as David did against Goliath, with five smooth stones: 1) Self-awareness. We have to know who we are and where we came from. 2) Commitment. We have to be prepared for a life-long journey. 3) Sacrifice. We must love those we are fighting for. 4) Courage. We must not leave the battlefield until the last child is accounted for. 5) Preparation. We must be part of a purpose-driven organization working for justice. 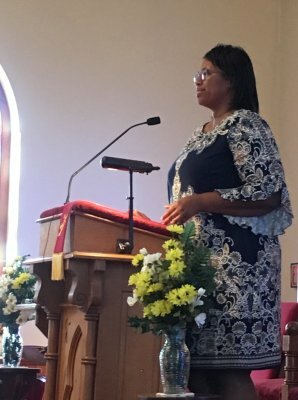 The newly-elected President Deborah H. Travis shared the branch’s vision for the next year of a commitment to “Advocacy through Education and Activism.” Following a benediction by Rev. 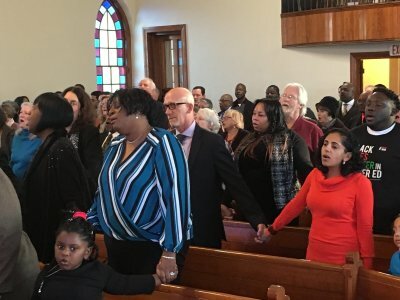 Douglas Kanney, the celebration closed with all participants and attendees singing a moving rendition of “We Shall Overcome” as everyone held hands in unity. A reception was then held in the Fellowship Hall. -Thanks to our out-going President for her service. Karen Jones and Rita Irvin. -Keynote speaker, Brandy Faulkner. Invocation with Marlin Reeves. -Martin Luther King Jr. Community Award winners, Dr. Alexa Casey and Alzeria Patricia Dillard. Incoming President Travis shares Branch's vision for the year. -Pianist Michael Hicks leads the closing hymn. -Swearing in of officers for 2019-2020. -Welcome from our political action chair, Karen Jones. 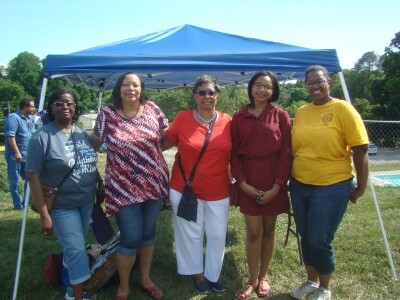 Christiansburg, VA --- Montgomery County-Radford City-Floyd County Youth Council in partnership with the Adult Branch and Pulaski Branch hosted the annual Juneteenth Celebration on Saturday, June 16, 2018, at the Rosa L. Peters Playground. Juneteenth is the commemoration of June 19, 1865, when the slaves in Texas learned of the Emancipation Proclamation. This year’s celebration was attended by close to 300 people from across the New River Valley. During the event, the Youth Council presented information about Juneteenth and shared their talents. Entertainment included a musical performance by Miss Jazmyn White who sang while accompanied by Miss Tyler Graves who played acoustic guitar, and a praise dance team “God’s Little Princesses” from First Baptist Church Rock Road, Radford. Ajnah Toliver, founder of The Black Wizzes of Science, made an informative presentation and quizzed the audience on Black history facts. Shawanda Marie from the New Orleans Creole Story Pot shared stories rich in the culture of New Orleans. We also had healthy food cooking demonstrations from the SNAP/Ph/Farmacy Garden and a free yoga session compliments of NRV Wellness. The Juneteenth Celebration included informational booths from civic, social, and advocacy organizations: Virginia Organizing; Safe Kids Information Table with Carilion Health; League of Women Voters of Montgomery County; Christiansburg Institute Alumni Association; Christiansburg Ruritans; NRV Seventh Day Adventist Church; Montgomery-Floyd Regional Library; NRV Master Gardner Association; New River Valley Master Naturalists; Moms Demand Action; Christiansburg-Montgomery County Kiwanis; New River Agency on Aging; and Project Hub. We were also joined by the local history organizations: the Montgomery Museum and the Wake Forest Community Action Club which maintains the Wake Forest Museum. Local political committees including the Montgomery County Democrats; Montgomery County Republicans; Radford City Democrats; New River Valley Greens; Griffith for Congress; and Flaccovento for Congress. 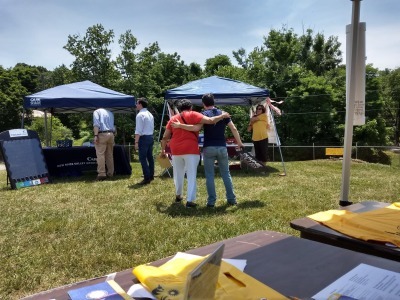 The Christiansburg Police Department and Montgomery County Sherriff’s Department shared information on children’s safety and the big hit was the Fire Engine from the Christiansburg Fire Department. Master Sergeant’s BBQ food truck was on hand with a variety of soul food items. Joining the celebration also were our elected officials from Christiansburg, Blacksburg, Radford, and Montgomery County. Mayor Michael Barber of Christiansburg, Senator John Edwards and Senator Dave Suetterlein all gave greetings. Representative Morgan Griffith and Democratic candidate Anthony Flaccovento were also in attendance and greeted attendees. We would like to thank all who participated and contributed to the success of the event. 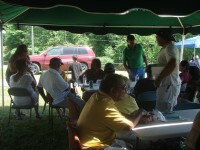 The Juneteenth celebration is also a fundraiser for the Youth Council. As a part of their entrepreneurship program, they sold hot dogs, chili dogs, chips and drinks. People enjoyed the fun associated with a cake walk and a raffle of Peter Souza’s Obama: An Intimate Portrait. Additionally, a 50/50 raffle was held and won by Ms. Pauline Palmer, who donated her winnings to the Youth Council. Juneteenth is a time of community. Check out Facebook for more photos! Shootings of police officers in 2016, sometimes claimed to be in retaliation for police shootings of black citizens, led to a Blue Lives Matter movement. 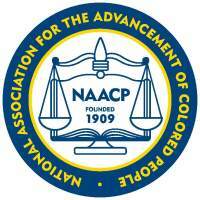 The NAACP has the greatest respect for the job of police officers and all emergency responders. When called on to participate in a BLM protest in Blacksburg on July 11, members made a point of speaking with police officers, and made sure they knew that in honoring Black lives, we also wanted to honor “Blue” lives as well. While it is important that all lives matter, it is the job of the NAACP to educate and act on issues where the rights of inorities in this country are especially in danger. Last October President Obama said, “I think that the reason that the organizers used the phrase Black Lives Matter was not because they were suggesting that no one else's lives matter ... rather what they were suggesting was there is a specific problem that is happening in the African American community that's not happening in other communities.” That is exactly the point that the NAACP stands for. Please join us in showing support for Black and Blue lives, without any disrespect for all lives! The Local branch of the NAACP has been active in the Black Lives Matter movement since its beginnings in August 2014. In December 2014, the VT branch of the NAACP, in coordination with the VT Black Student Alliance and the local NAACP, staged a week of candlelight vigils on campus. These included marches across campus, and a 4½ minute “die-in” in the Squires Student Center to commemorate the 4½ hours that Michael Brown’s body lay in the street after his death. After the die-in, an open-mic teach-in was held n Squires so that students, especially African-American students, could share their experiences of racism on campus and off. In 2015 racially motivated shootings occurred in Charleston SC, and in Roanoke VA. While these events have brought attention to oppression that has always existed, the attention has increased the desire for open conversations about race, and it has increased the need for good people to make themselves heard. 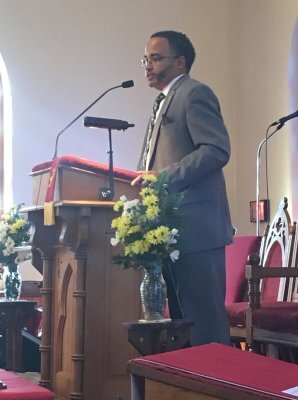 On October 26, the branch partnered with three local organizations to sponsor a “Call to Action: Healthcare Access as a Moral Imperative.” The event, held at the UU Congregation Meeting House, promoted the need for affordable access to healthcare, and discussed the provisions of the Affordable Care Act. After a documentary about the challenges of getting care in rural areas, and a personal story from a resident of Bland County, an interfaith panel discussed how health care is viewed from each perspective: Jewish, Muslim, Protestant, and Catholic. The documentary and personal story emphasized how those in need do not want to ask for help or rely on spotty charity. leadership training activities. Through the Samuel H. Clark Memorial Scholarships, high school graduates who were Youth Council members, or whose parents or grandparents are NAACP members, can receive a grant for post-secondary education. Youth Council members (l-r: Allison Foster, Samaya White, Jasmyn White and Zamora White) buy food and gifts for “Blue Santa” Project at Christmas for those in need. Photo courtesy of Debbie Travis. 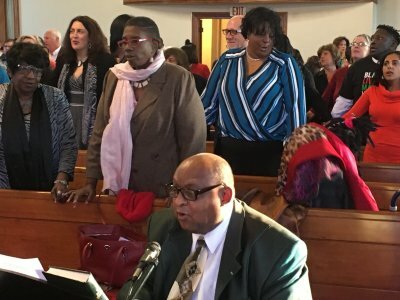 Last fall the national NAACP organized “America’s Journey for Justice” to commemorate the 50th anniversary of the 1965 Voting Rights Act and to remind Americans of the continuing challenges to ensuring the voting rights of all. Several members of our branch attended the culmination of this event on October 5th in Washington DC. They met with staff of Representative Bob Goodlatte’s office to share their concerns. Goodlatte is responsible for holding hearings on violations of the Act. The 2015 school year at Christiansburg High School began with several students bringing Confederate battle flags onto school property. This was forbidden by the school code of conduct and led to numerous heated discussions. The local branch sent a letter of concern to the School Board and Superintendent, and then many members attended the October 20th board meeting to show or voice their concerns. We were pleased that the school board stood behind the CHS administration and extended the code to all county schools.